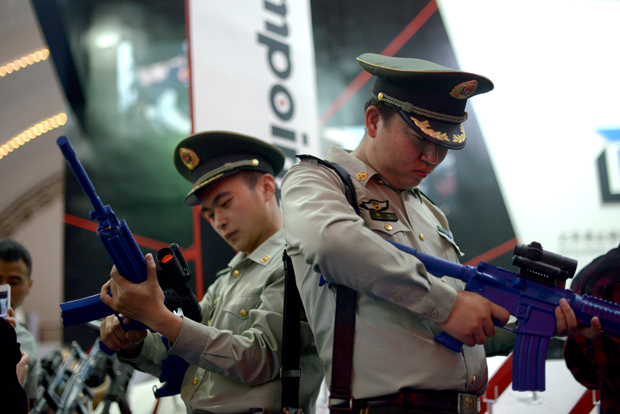 Two Chinese paramilitary police test a telescopic sight fitted on a gun model at the China International Exhibition and Symposium on Police Equipment and Anti-Terrorism Technology and Equipment (CIPATE) in Beijing on May 15, 2013. Amnesty International and the Omega Research Foundation recently published a new report that alleges China is selling hundreds of millions of dollars in so-called "torture tools" to African governments. Despite mounting evidence these devices are being used to commit severe human rights abuses, little is being done to regulate or limit their sale. Patrick Wilcken is a security trade and human rights researcher at Amnesty and a co-author of the report. He joins us this week to discuss China's booming trade in these repressive instruments.